This was a nice opener. Fairly short, but pretty competitive. HZK seemed to have the upper-hand most of the time, but Hetzza put up a good fight in the time she had. This was okay. Gabby is still pretty new and it showed, but she and Hana were able to put on a nice match. Hana was in control for the first part, and that looked good. When Gabby took over it was a little less believable, but it wasn’t bad. Kimura looked strong in this, both in her ability to put together a good match, and physically when she powered Ortiz over in a vertical suplex that looked like it was more difficult than it should have been. Very good match! This one built to a really great climax, gradually picking up the pace and incorporating bigger and harder moves. These two women worked extremely well together, and both seemed to be even as far as skill is concerned. Very good match. Mimura started the match against Matsumoto, and the size difference seemed gigantic. The match seemed to be built around Mimura’s diminutive stature, putting her in peril a lot but also having her show the most determination and heart throughout the match. The match broke down fairly quickly, so the majority of the match was full of high-energy chaos. This was fun and well done by all four women. Very good match. While the previous tag match tonight was chaotic, this one mostly stayed under a semblance of control. It did break down from time to time, but there were more frequent tags and more time with only two people being in the ring at any given time. Of course, both teams worked well when it came to teamwork and making saves for their partners, but Team Jungle seemed to e upper hand in that area. Yoneyama is deceivingly good at times, and she was impressive here. 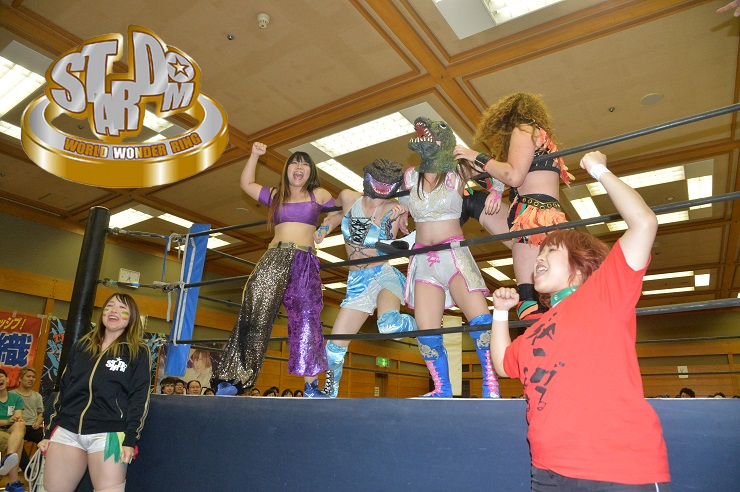 Her influence on how the match progressed and ended shouldn’t be underestimated even given that Bito and Kyona are probably the stars of this matchup. This was a good main event for a show that didn’t have any real impact on feuds and story lines. I liked this show. It got very good starting with the Kagetsu vs Shanna match. Nothing important really happened, but it was very fun to watch. This is a tough call since the final three matches were all very good for different reasons, but this match surprised me with how much I enjoyed it. I think it has a lot to do with the way it built very nicely to the final segments of the match. It felt natural and organic the way the match moved along. I’d love to see this match happen again.